New Dawn, which has five mines that are currently operational and producing gold in Zimbabwe, reported consolidated gold production for the quarter ended December 31, 2011 of 9,095 ounces (8,399 ounces attributable to New Dawn, after adjusting for the minority interests' share of gold production), as compared to consolidated gold production for the quarter ended December 31, 2010 of 4,808 ounces (4,577 ounces attributable), an increase of 89.2% (83.5% increase on an attributable basis). As compared to consolidated gold production for the previous quarter ended September 30, 2011 of 8,814 ounces (8,212 ounces attributable),consolidated gold production for the current quarter ended December 31, 2011 increased by 3.2% (2.3% increase on an attributable basis). Consolidated gold sales for the quarter ended December 31, 2011 totalled US$15,440,766 (US$14,238,642 attributable) at an average sales price per ounce of gold of US$1,684, as compared to US$6,458,735 (US$6,184,661 attributable) for the quarter ended December 31, 2010 at an average sales price per ounce of gold of US$1,370, an increase of 139.1% (130.2% increase on an attributable basis). As compared to consolidated gold sales for the previous quarter ended September 30, 2011 of US$14,059,739 (US$13,145,209 attributable), consolidated gold sales for the current quarter ended December 31, 2011 increased by 9.8% (8.3% increase on an attributable basis). 100% of proceeds from gold sales were received in US dollars. At December 2011 month-end, an additional 2,337 ounces of gold awaited export documentation for sale in South Africa, and will be included in January 2012 sales. With December 2011 total gold production of 3,252 ounces, equivalent to annualized gold production of 39,024 ounces, the Company achieved its production target of 38,000 to 40,000 ounces of annualized gold production within its projected timeframe, despite four public holidays in Zimbabwe during December 2011. The Company will file its unaudited consolidated financial statements and related materials for its fiscal first quarter ended December 31, 2011, and report its consolidated results of operations for such period, on or before the extended filing deadline of March 15, 2012. The filing deadline has been extended by 30 days from the standard February 15 filing deadline as the fiscal quarter ended December 31, 2011 is the first fiscal period in which the Company will be reporting financial information under International Financial Reporting Standards. 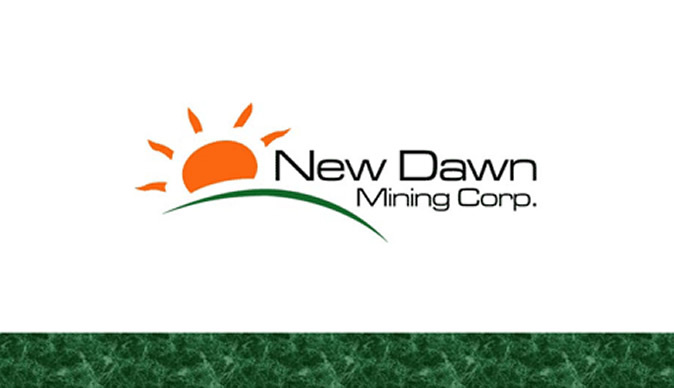 New Dawn has five mines that are currently operational and producing gold in Zimbabwe, and is currently expanding production to reach a targeted run rate of approximately 60,000 ounces of annualized gold production by December 2012.